It’s a tickling irony that on the day Ireland announced it’s going to be the first European economy to exit its bailout programme, the chief executive of insurance giant RSA has stepped down over problems with its Irish business, sending the company’s share price down by 17%. 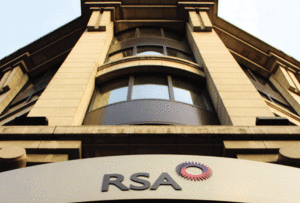 RSA has been in difficulty for several weeks now: this morning it issued its third profit warning in six weeks, having revealed at the beginning of last month that it had discovered ‘accounting irregularities’ at its Irish operation. Originally, those ‘irregularities’ were thought to add up to about £70m, but this morning the company admitted it will need another £130m to keep going. That makes a total of £200m. So it’s no wonder chief executive Simon Lee ‘felt it was in the best interests of the group that he step down to enable a change in leadership’, in the words of RSA chairman Martin Scicluna. Lee, who will get a year’s pay, has got off lightly compared with others involved in the scandal: from RSA’s Irish arm, chief executive Philip Smith, chief financial officer Rory O’Connor and claims director Peter Burke have all been suspended. RSA was keen to emphasise that this discovery isn’t a total, bank-during-the-credit-crunch, bailout-requiring disaster. It will put £135m of capital into its Irish arm, which will, it hopes, keep its solvency rate ‘above 200%’. But at the same time, it was realistic: storms in the UK and Scandinavia during December caused £25m worth of claims (that’s a lot of blown-over patio chairs), leading the company to admit that ‘we now expect mid-single digit group return on equity in 2013’. That’ll disappoint shareholders, whose annual payout was cut by a third earlier this year. Presumably they were hoping for a nice little Christmas bonus. Scicluna, who will take over Lee’s executive duties until a replacement can be found, tried to sound chirpy. ‘We are confident this represents the full financial extent of the issues we’ve been facing in our Irish business,’ he said, hopefully.